The world's oceans are full of shipwrecks. Many of these lost vessels have gone down in shallow coastal waters, and their remains have spawned an entire industry devoted to taking recreational scuba divers out to explore them. Countless others have been lost far from shore, their shattered skeletons swallowed by the dark abyss of the deep ocean; such deep water shipwrecks are unreachable by all but the deepest diving submersibles. There are very few hard edges in the world, however, and the adventurous soul can't help but ask: What about those shipwrecks found in the twilight world, lying somewhere between the easily explored and the unreachable? The recent revolution that has coined the term "technical diving" promises to stretch the limits of what is achievable by amateur divers. In the process, a new era of exploration has begun—an era where shipwrecks previously considered beyond reach now beckon to be explored. The wreck of the Norness has haunted my dreams for years; I have longed to explore her sunken hulk almost since I began wreck diving some 15 years ago. Reality, however, had forced me to push this dream back into the deepest recesses of my mind—the Norness lay deep, far beyond the normal limits of scuba diving. With the introduction of technical diving, however, my secret fantasy was suddenly reawakened. It now appeared that the dive was possible by using mixed gas scuba. As a shipwreck, the Norness was just another sunken tanker, sent to the bottom by prowling German U-boats during the winter of 1942; but as a part of history, she held enormous significance. A 10,000 ton Norwegian oil tanker, the Norness was the very first ship sunk off the US east coast during World War II. Her sinking, on January 14, 1942, proclaimed the beginning of six months of the bloodiest onslaught on merchant shipping the United States had ever seen. The American "Battle of the Atlantic"
Most wreck divers are all too familiar with the American "Battle of the Atlantic." Indeed, a large percentage of the wreck sites frequented by divers were created by Germany's marauding U-boats during World War II. Some 100 ships were sunk off the US east coast, from Maine to Florida, during the first six months of America's involvement in the war. Germany's Admiral Karl Donitz had implemented a secret operation, code named "Paukenschlag", almost immediately after the declaration of war between the United States and Germany. A fleet of long range, type IX U-boats were sent across the Atlantic where they began a coordinated surprise attack against American coastal shipping. While Donitz originally requested twelve U-boats for the operation, only five were ultimately available for the first strike against America. The five submarines assigned to the mission departed Germany in the closing days of December 1941, only weeks after the Japanese attack on Pearl Harbor. Observing radio silence during the Atlantic crossing to take advantage of the element of surprise, the U-boat commanders were under strict orders to sink no vessels unless they exceeded 10,000 tons. Smaller targets were not worth the damage their sinking would cause to the operation by revealing the U-boats presence, and their mission, to the Allies. Only Reinhard Hardegen encountered and attacked a vessel meeting these guidelines during the crossing, torpedoing the passenger steamer Cyclops, 160 miles southeast of Nova Scotia on January 11th. After sinking the Cyclops, Hardegen's U-123 headed at high speed toward its assigned target area—the entrance to the busy shipping port of New York. Donitz had signaled the Paukenschlag boats by wireless on January 9th that the operation was to begin January 13th—all Allied merchant shipping off the US coast would then become legal targets. The first victims of the five U-boats were the freighters Friar Rock and Frisco, sent to the bottom off the northern coast of Nova Scotia by U-130, on the night of January 13th. The following day Hardegen struck the first blow in American waters when he expended five torpedoes to sink the huge, 10,000 ton Norwegian tanker Norness. Two of the torpedoes turned out to be "duds," failing to explode or missing their mark, but three of the steel fish ignited the Norness into a fiery inferno that lit up the night sky. The following day American newspapers reported the Norness' sinking to a shocked public, starkly proclaiming the arrival of the submarine war on American shores. What followed the sinking of the Norness was a merciless, six month slaughter of merchant ships along the US coast. German U-boats kept a constant vigil along the eastern seaboard, sending anything that crossed their paths to the bottom. Ships were sunk at the rate of one per day at the height of the campaign, yet it would be three long months before a single U-boat was taken out of action in these same waters. Finally, after six months of incessant battle that matured the American defensive forces, the tide began to turn against the U-boats. In July, U-boat sinkings nearly equalled the number of merchant sinkings in American waters. It had become too costly for Admiral Donitz to maintain an attacking force off the US coast, and the submarines were withdrawn. John Chatterton was a man who shared my dream. One of the captains of the dive charter boat Seeker, operating out of Brielle, New Jersey, he had the drive to make an expedition to the Norness happen. Two years earlier, Chatterton had found a still mysterious sunken U-boat 60 miles off the New Jersey coast, since dubbed "U-Who" due to its unknown identity. (Note that this U-boat has been identified as the U-869 since this article was originally published.) During the winter of 1992, hungry for new wrecks and new adventures, Chatterton began organizing a trip to find and dive the wreck of the Norness. Her location was a bit of a problem. She was sunk approximately 60 miles southeast of Montauk Point, Long Island, and her generally accepted location was marked by a wreck symbol on NOAA charts of the area. But finding a sunken wreck in the vast expanse of the open Atlantic is no easy matter. Loran numbers for her location were obtained from various fishermen, but their accuracy was unknown; in fact, several different sets of coordinates were found to exist, none of which agreed! Assuming we could find her, the depth as charted by NOAA was approximately 270 feet, but the actual depth to the wreck was also unknown; she might lie shallower, or perhaps deeper, than the charts indicated. Since we had no way of knowing whether she lay upright, on her side, or even "turtle," gas mixes had to be planned for all contingencies. Some insight into the wreck's possible condition could be gleaned from her nearby sister in battle, the wreck of the Coimbra. Sunk the day after the Norness, also by Hardegen's U-123, the sinking of the Coimbra was so similar to that of the Norness it seemed plausible the two wrecks might be found in a similar condition. While only two torpedoes were used to destroy the Coimbra, rather than the three that sank the Norness, both tankers' backs were broken by the resulting explosions. Both ships were also known to have initially sunk only partway, with their bows left protruding from the rough winter sea for many days after they had been ripped in half. Indeed, after sinking the two tankers, Hardegen made a sarcastic notation in his war diary about leaving a trail of sunken ships leading right to the entrance of New York Harbor! The Coimbra's condition is well documented, since she lies in shallower water (approximately 180 feet) and has been visited many times by advanced sport divers. While her hull is relatively intact and lying on its starboard side, she is broken at both of the torpedo impact points and rises at least 30 feet above the ocean floor. If the Norness wreck was indeed similar to that of the Coimbra, her upper side might even be diveable using air and ordinary scuba gear. During the summer of 1993, John Chatterton managed to squeeze a three day expedition into the Seeker's busy dive schedule to look for, and hopefully dive, the wreck of the Norness. The expedition was scheduled for early August with the anticipation of favorable sea conditions and good visibility. While there were no guarantees we would even find the wreck, ten daring adventurers signed on for the trip, aspiring to be among the first to see the Norness in over fifty years. Nine of the divers would explore the shipwreck on trimix (a gas mixture of helium, oxygen and nitrogen), while the tenth was a dedicated support diver breathing air, to be available at all times in case of an in-water emergency. The team assembled included some of the top divers involved in east coast wreck diving: John Chatterton, Ken Clayton, John Comly, Dan Crowell, Gary Gentile, Brad Henderson, Barb Lander, John Yurga, and safety diver Tom Surowic, as well as the writer. In order to accommodate three days of trimix diving, many of the gas mixtures were made on site using large storage bottles of helium and oxygen, along with air from the dive boat's two compressors. Bottom mixes varied according to individual dive plans and personal preferences, ranging from trimix 10/40 to 18/30. Nitrox was carried in stage bottles and surface supplied oxygen rigs were hung over the side of the boat in order to facilitate the long decompression times that would be required. Several weeks earlier, on the way back from one of the Seeker's Andrea Doria expeditions, Chatterton had taken the opportunity to check out some of the loran coordinates for the Norness wreck. While several of the locations showed nothing on the bottom recorder, one set of numbers indicated a large object rising some sixty feet off the ocean bottom. Surely this far out at sea, in such a remote location, this large obstruction could only be the Norness. Since we now knew that the loran coordinates were good, expectations were high on the trip out to the wreck site. Shortly after our arrival on the morning of August 10th, I was thrilled to get my first glimpse of a wreck I had only dreamed of for the past fifteen years: the Seeker's video depth sounder showed a large, non-descript, red-and-yellow mound rising above the flat ocean bottom. Little could be learned by studying the sonic profile shown on the fathometer's video screen, however. 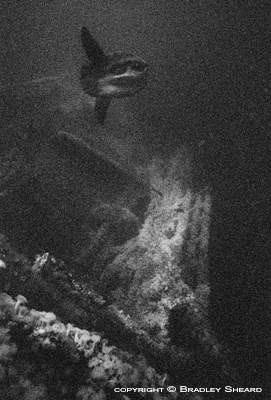 While the object rose high above the bottom, there were no distinguishing features to indicate how she sat—indeed, my best guess from the "picture" we were seeing was that she lay "turtle," or upside down; I tried to hide my disappointment and hoped I was wrong. A grapnel dragged across the wreck quickly snagged the sunken obstruction; the Seeker swung around and we found ourselves at anchor over the first American victim of "Operation Paukenschlag." As soon as the boat swung around, however, we could see that we had a problem—the current was roaring by the now stationary dive boat at over 2 knots. After months of preparation, the conditions were undiveable. Hours passed slowly as anxious divers looked over the side of the boat and watched the ocean rush past, contemplating just how hard it would be to fight that current, and even more frightening—how difficult it would be to hang onto the anchor line for the hours of decompression the dive would entail. After two or three hours had passed, the current appeared to be subsiding just a bit—or perhaps we just couldn't wait any longer. 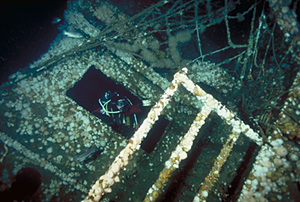 John Chatterton and John Yurga suited up as they prepared to secure the anchor to the wreck—they would be the very first divers the Norness had ever seen. Loaded down with twin 120 cubic foot cylinders, pony bottles, stage bottles of decompression gas, dive lights, emergency ascent reels and all the other paraphernalia commonly carried by east coast wreck divers, the two looked like a pair of aliens from another world; in fact, they would very shortly be just that. The two and one-half hours it took for the first team of divers to return from their dive seemed like an eternity to those of us left on the dive boat. For the sake of safety, all divers would await the return of the tie-in crew, and their report of the conditions below. Only after we knew that the anchor had been securely fastened to the wreck, lying over two hundred feet below us, could we make our own dives. While everyone's thoughts were their own that afternoon, I am quite certain that they all came in the same flavor: was this in fact the Norness we were anchored over? Was she upside down, right-side up, or perhaps lying on her side? What was the visibility? My own thoughts were plagued by the uncertainty of visibility—would I be able to capture her on film? When the tie-in team finally climbed back onto the dive boat, John Chatterton had a broad grin across his face and said to me: "Brad, bring your camera—it's awesome! Visibility has to be at least 60 feet." My dream was about to come true. I was nervous about fighting the current that was still running, carrying two stage bottles clipped to my side and towing a 15 pound camera. Fortunately, the current dropped out at about 60 feet and the water was still and clear for the remainder of the descent. As the ambient light faded away, Dan Crowell and I entered the slate gray, colorless world of the deep ocean. Countless specimens of oceanic plankton hung motionless in the depths as we dropped further into the dark abyss. Short-tentacled, clear jelly fish that I had never seen before pulsated slowly by us, while huge salp chains hung suspended like giant strings of DNA. While salp chains are often seen on inshore wrecks, they are generally found in short, broken strands; the chains here were larger than any I had ever seen before, measuring ten and twenty feet long. We were nearly 200 feet from the surface when the pale, ghostly form of the Norness' stern loomed up out of the depths. Lying on her starboard side, the entire wreck was carpeted with white, flowery sea anemones. In the dark depths of the Atlantic, the white anemones gave the wreck an eerie appearance and she almost seemed to glow in the dark. As we reached the end of the Seeker's anchor line, which had been tied into the stern companionway railing, Dan and I landed on the port side of her hull. A row of portholes punctuated her hull plates, running parallel to the companionway, while below us were doorways leading into the ship's interior. The visibility was indeed spectacular, and as we peered over the ship's railing and across her decks, sloping downward at an 80 degree angle, we could see that the majority of her superstructure was remarkably intact. 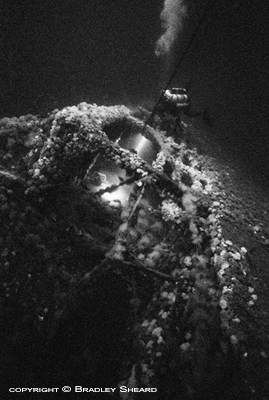 In fact, it was one of the most intact WWII wrecks I had ever dived. It was probably the extreme depth in which the wreck lay that had preserved her, effectively isolating her from surface wave action during even the most severe storms. Or perhaps, I thought giddily, the abandoned fishing nets that she was wrapped in had held her together over the years—the wreck was so enveloped in nets that she looked like a "shrink-wrapped" plastic toy. The nets were large-meshed monsters, made of twine so heavy that white anemones clung to the strands of netting as well as the hull, increasing the eerie appearance of the scene laid out before us. As Dan entered one of the doorways leading into the ship's interior, I dropped down from the upper gunwale and glided over the ship's inclined deck. Adjusting my buoyancy, I floated weightlessly in the still water, drifting effortlessly over the decks of the sunken tanker that had begun Germany's assault on American coastal shipping. She was a beautiful sight to behold, especially after all the years of dreaming about her. Her hull appeared to have been severed cleanly at one of the torpedo impact points, somewhere between the ship's forward navigational bridge and stern living quarters. The ship's forward half was nowhere to be seen, despite the clear, dark water in which she lay entombed. Dozens of fishing nets draped down over her hull, forming a white mesh blanket that obscured many of the ship's details. Somewhere in the blackness below lay the ocean bottom; but the deeper we went, the hazier the water became. I chose to remain high on the wreck where the water was clear and attempt to photograph the surrealistic scene that lay before us, while Dan probed the depths of her dark interior. Although the water was clear, it was also very dark to the camera's lens. The human eye can adapt to such conditions and see with relative clarity even by candlelight, but unfortunately photographic film does not have this same sensitivity. I had elected to use high speed black & white film in order to capture a wide angle "seascape" of the wreck. While the use of strobe lighting would have enabled me to use color film, I would have only been able to capture the details of the wreck*mdash;I wanted to photograph the forest, not the trees. As I turned and began swimming back toward the anchor line, I saw Dan re-emerge from the ship's interior. At that instant we were joined on the wreck by a huge ocean sunfish. I had often seen these strange looking fish on the surface, and occasionally in the depths on other shipwrecks, but I had never seen one this deep before. Together, the three of us swam about the decaying remains of the tanker's stern for another ten minutes, like three ballet dancers in a silent symphony. I marveled at the effortless ease with which the sunfish swam over the wreck—an effort we could only imitate with the use of high technology and special gas mixtures. On the ship's stern stood the remains of a huge gun tub, placed there for protection from the very U-boats that had sent the Norness to the bottom. The tub appeared to be empty, with the gun nowhere to be seen. A staircase interconnecting deckhouse levels stood at a crazily canted angle, almost unrecognizable in its fluffy white covering of anemones. A solitary boat davit protruded erectly from the upper gunwale, the only evidence left of the boats used to abandon the sinking tanker on a dark January night nearly one-half century ago. Down below, glowing a ghostly white in the dark gloom of the depths, stretched the tanker's centerline catwalk; perfectly preserved handrails formed parallel strands of plush, white velvet rope running the length of the ship's deck before ending abruptly at the hull break. And everywhere dangled the eerie remains of fish nets. All too soon our allotted twenty minutes of bottom time were over and we were forced to begin our slow ascent. The decompression that stood between us and a safe return to the surface was formidable, but it also provided time for reflection about what we had just accomplished. For me it had been the achievement of a long standing dream—to dive the very first American victim of "Operation Paukenschlag." The dive itself was an adventure that outshone any other dive I had ever made, and one whose memories would last a lifetime.